We all know that Windows comes with a free calculator. Microsoft has even redesigned the calculator from scratch for their latest operating system Windows 7. The improved calculator offers the four modes standard, scientific, programmer and statistics now. All have in common that the calculator is fine for some basic equations, but less so for complex equations. That's where other scientific calculators come in. Red Crab is a free and portable calculator for Windows that is perfectly suitable for complex algebraic equations like fractions, square roots, exponents and a lot more. The best option to take a look at the calculator's capabilities is to load a few of the demo projects that ship with the download. Probably the biggest difference to Windows Calculator is the ability to add characters and symbols everywhere, just like it is possible on normal paper. This provides enough room to add complex equations and functions on the page. Multiple functions and equations can be added to the same page, with the possibility to use results for further calculations. The scientific calculator opens two windows on startup. 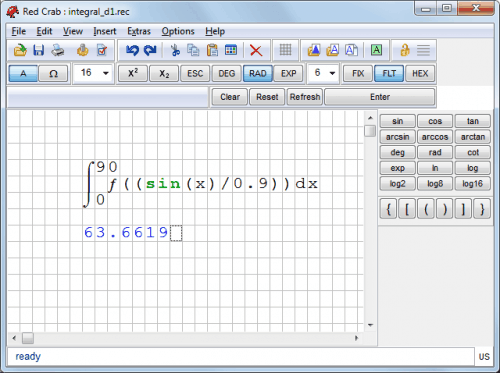 The main window with basic controls and the text area for the equations, and an extra window with functions and symbols. This extra window can be docked to the main window by clicking on View > Panel Undocked. There is a lot to explore, and the best place to start is the extensive user manual. The contents include information on how to write mathematical expressions, use the tools to change font sizes or superscript, use the function and symbol panel, keyboard shortcuts and basic information on how to work with the scientific calculator. The developer has created a few tutorial videos to demonstrate some of the calculator's functionality. 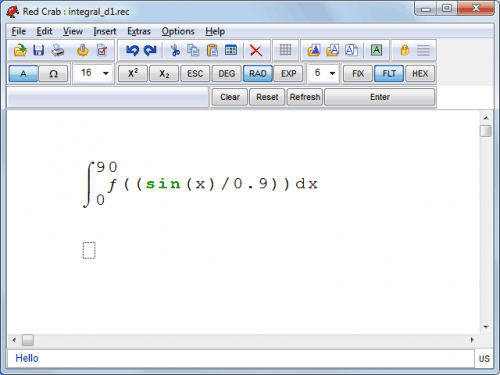 Users who are interested in the scientific calculator RedCrab can download the program from the developer homepage. Get off the dope mate and phrase your sentences comprehensibly. This works for me: http://www.sfr-software.de/cms/EN/windows/sfr-calculator/ I think it can be found on CNET too, at least the phone version. Make comments, run virtual tapes, make templates, etc., etc. Versions for PCs and phones. RE my previously posted comment. This app makes no claim to being a scientific calculator. Sorry, I should have paid more attention. SMath Studio is also free and open source, but can also draw graphs, including 3D, and there are also PocketPC (=WM Pro and Classic) and Smartphone (= WM standard edition) editions! Web-based calculators are more convenient than carrying around a clumsy electronic calculator. its mani. I need Scintific Calculator Software for free download.